OUR "BNWAS" IS DESIGNED AND APPROVED WITH THE FOLLOWING SPECIFICATIONS. INSTALLATION: BY THE VESSELS CREW, OR ANY LOCAL ELECTRICIAN OFFICIALLY. No commissioning required OFFICIALLY. 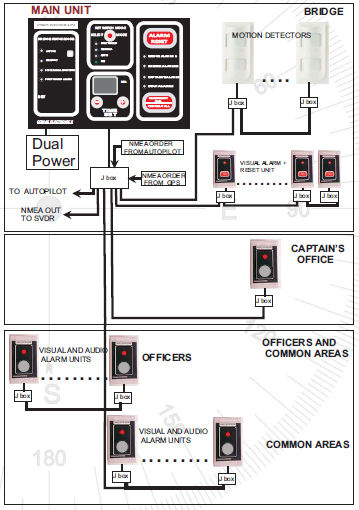 The connections to: Autopilot, Gps, and VDR, are optional according to IMO requirements. 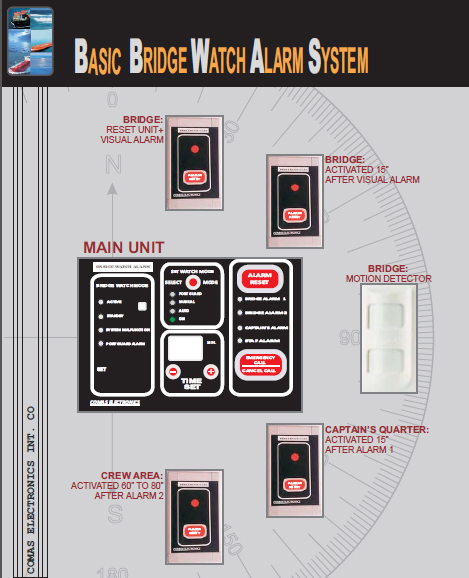 MAINTENANCE FREE OFFICIALLY: TYPE “A” SYSTEM Is designed and configured so that it can be OFFICIALLY INSTALLED AND MAINTAINED BY THE VESSELS CREW, OR ANY LOCAL ELECTRICIAN. Is a common system, and is made to be INSTALLED + MAINTAINED by technicians. COMAS Electronics certifies that this product met its published specifications at the time of shipment from the factory. If it arrives with defects at the customer it will be replaced free of charge under the condition that the defected product will returned to the factory.